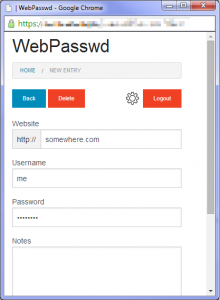 WebPasswd is a password app that I have been working on, its a self hosted PHP app, that stores usernames and password (along with notes) in an encrypted file. Here is a quick class for dealing with PKCS#5 style padding. This padding is useful for encrypting data with DES/AES which have a multi-byte block size. MCrypt will by default pad out to the next block boundary with Null bytes which will show up in the decrypted data. A good explanation can be found here.